Thus begins a wonderfully written children’s book, with a new version of the Twelve Dancing Princesses, one of the Grimm fairytales. Luckily, unlike the Grimm version, this one is positively entrancing. 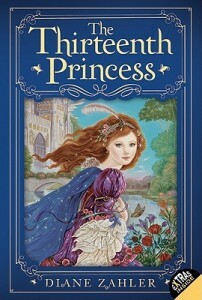 The thirteenth of the princesses is a wonderful heroine, along with a soldier and a stable boy. The mystery of the enchantment placed on the princesses becomes more and more intriguing. The story has a bit of a sad ending, but in truth, it works, because there are so many lovely lessons in the book about the need for balance in one’s emotions. The dreadful danger that comes from obsession is balanced by the healing power of genuine love. If you love magical characters, then the kindly witch Babette in this children’s book will stay with you. For feminists, I suppose there could be no end of objection to a children’s book that lays out yet another series of princesses who want to be married. But for those of us who still enjoy old-fashioned notions, the book is harmless and well-written. And after all, the eldest princess winds up become head of the kingdom, so that balances out the last qualms of equality, doesn’t it? I think the book is probably a little over the heads of 9 or 10 years old, but they will get what they get. It works well for 11 and 12. Most likely by 13, the girls will be beyond fairy tales, even if they have been updated.